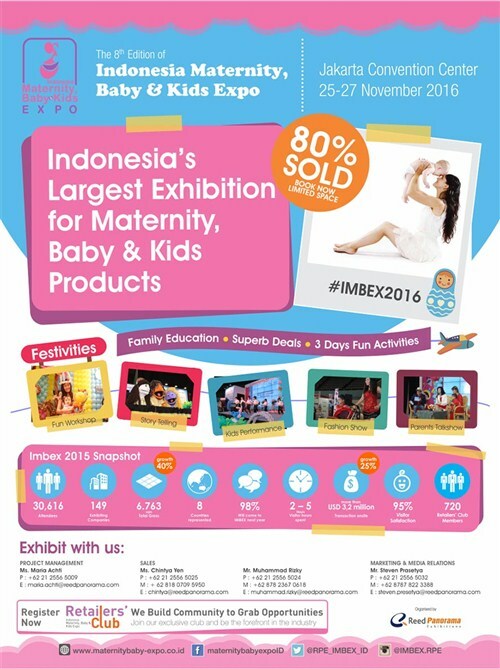 Indonesia Maternity, Baby & Kids Expo (IMBEX) is Indonesia’s largest exhibition for maternity, baby and kids products. The 8th edition of IMBEX will be held on 25 – 27 November 2016 at Jakarta Convention Center. Showcasing hundreds of local and international brands, IMBEX is staged not only as a business and trading platform but offers an exciting 3 days event filled with programs and activities, creating an unforgettable experience for the kids, babies, parents and others who visit.